Jeff whines to anyone willing to listen about my habit of sneaking veggies into every dish. He’s right – I do shove spinach into lasagna, cabbage into potstickers, cauliflower into mac and cheese, sprouts into sandwiches and peppers into quesadillas. Jeff, on the other hand, could go for weeks without consuming so much as a carrot stick. So I’ve basically given up on pulling the wool over his eyes. He has super-human veggie-radar. But if the veggie-avoiders in your life have a less developed system of vegetable detection, this zucchini crumble is an amazing way to sneak some green into their tummies. 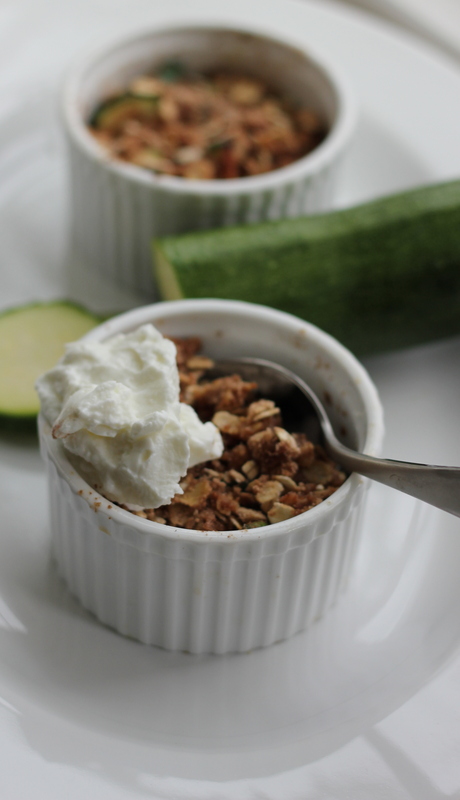 While it would never fool Jeff, this sweet zucchini crumble would probably pass for apple crumble with most zucchini haters. 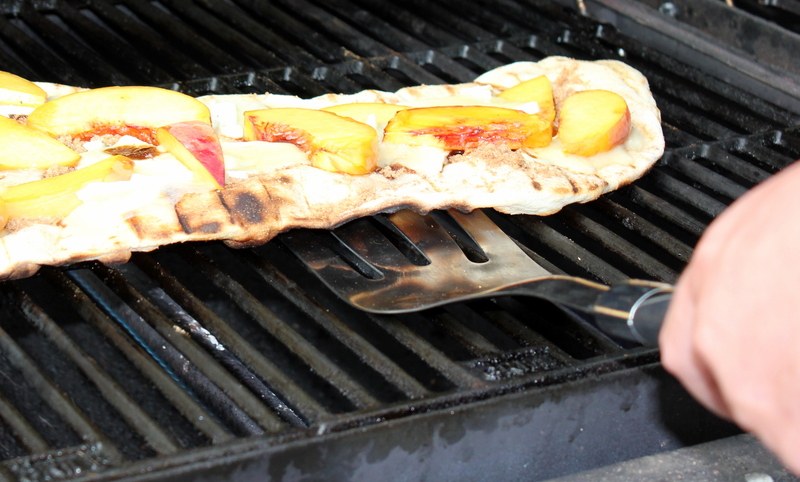 Zucchini is amazingly versatile. From ratatouille to chocolate zucchini bread it works in almost everything. But until my mother-in-law suggested last weekend that zucchini could take the place of apples in a classic crumble, the idea had never, ever occurred to me. She swore up and down that it would be delicious, but I couldn’t quite imagine it. So, of course, I immediately ran out and bought some zucchini. Despite my mother-in-law’s proclamation of zucchini crumble wonderfullness, I was fully expecting disaster. But you know what? It’s completely freaking delicious! Who knew? Well, my mother-in-law knew. 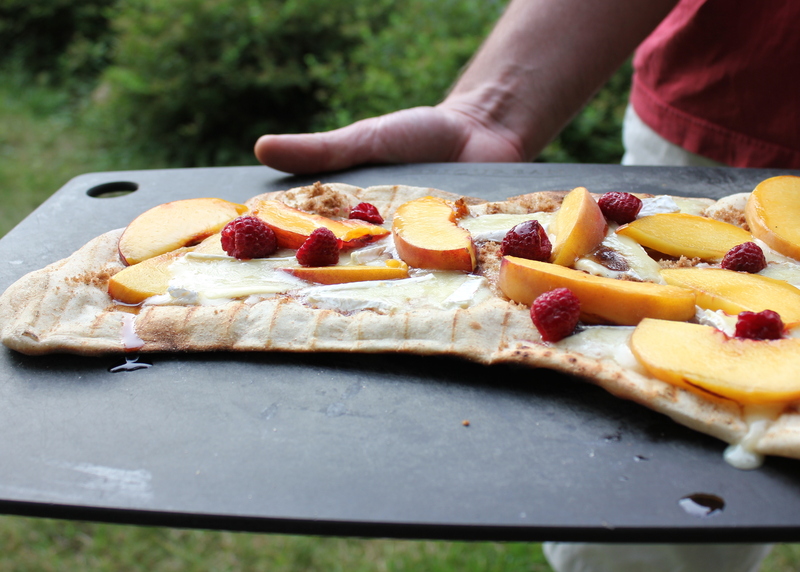 It isn’t quite like apple crumble, but it’s close. In fact, I might even like it better. The texture of the zucchini here is surprisingly lovely – soft enough to seem decadent but firm enough to stand up to the hearty oat crumble topping. The raisins add an extra burst of sweetness, but if you are feeling experimental, I think dried cranberries might add a nice tart punch. This crumble makes a great dessert served with a big scoop of vanilla ice cream. But I actually have been eating it for breakfast with a dollop of Greek yogurt. And I don’t even feel guilty about having dessert for breakfast. After all, I’m getting my veggies! Preheat the oven to 375 degrees. Grease four individual ramekins. In a large bowl, toss the zucchini with the raisins, sugar, half of the cinnamon, and the nutmeg. Divide the zucchini mixture among the ramekins. Stir together the oats, flour, brown sugar, salt, and remaining cinnamon. Add the butter and, using your fingers, rub the butter into the oat mixture until it is mostly incorporated. The mixture won’t be uniform, and that’s fine. 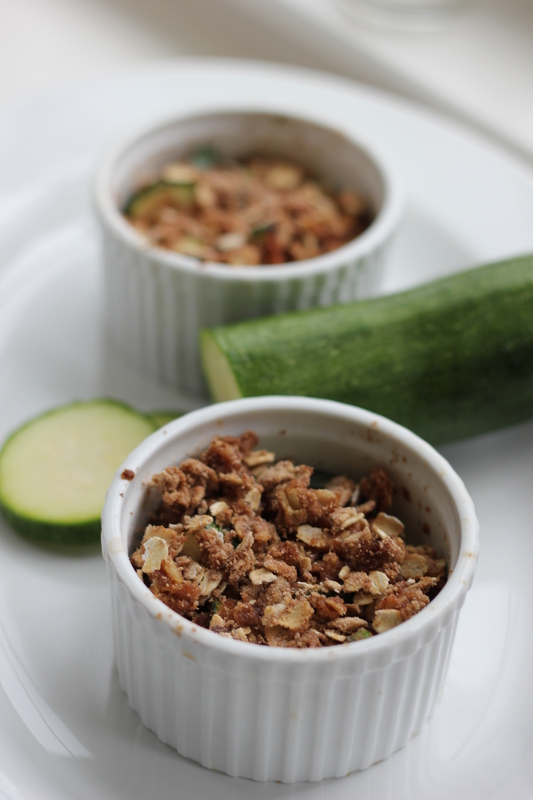 Top the zucchini in each of the four ramekins with a quarter of the oat mixture. 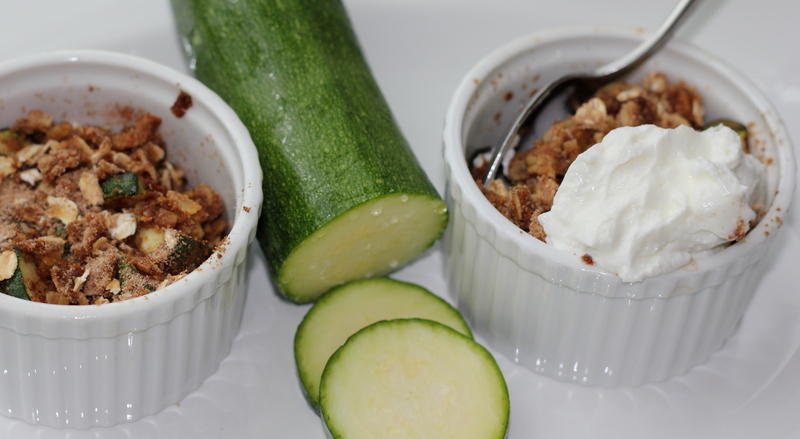 Place the ramekins on a baking sheet and cook for 30-35 minutes, until the top is golden and the zucchini is soft. Serve warm with ice cream, whipped cream, or yogurt.